This speckled canner is setting on top of the stove in the kitchen room box. This canner is made from card stock, it has wire handles and the "jars" of beans are sitting on a piece of plastic canvas. The plastic canvas is round, I think coasters are needlepointed from them. The jars are from medicine capsules. Our dog was taking medicine that came in clear capsules. Instead of giving her the whole thing, I emptied the capsules into her food and saved the capsules. (Check the Internet for empty capsules, I found them on www.iherb.com, empty capsules (it looks like size #1 by the measurements they give) or ask an independent pharmacist or health food store for them.) By putting a gold painted polymer lid on the rounded end of the capsules they became canning jars. I made beans from leaf green polymer clay. Tip for keeping the beans close to the same size: Roll out the clay with a pasta maker, thinnest setting and use a 3/16" Kemper circle cutter to cut circles. Cut these circles in half, this should give you the right amount of clay for a bean. You can always adjust this. I cut the lids out using Kemper circle cutters, too. Glue the lids on with Tacky glue, let dry. Turn the jar onto it's lid and fill with a little, very little resin. Then fill with beans. Experiment, the beans are going to displace the resin, you don't want spill over. Let dry. I got my resin from Hobby Builders, www.miniatures.com. I didn't put anything on the bottom of the jars, with the resin being hardened that was bottom enough. I was afraid that the resin would melt the capsule, but it didn't, all went well. Linden Swiss, www.lindenswiss.com makes very nice canning jars that you can use. Back to the canner, the diameter is about 1 1/16" to 1 1/8". I usually look for a small bottle for a form, I save sooo much. If you don't have one you could use a 1" dowel rod and wrap it with wide tape around one end until you have the diameter you want. The width of the card stock is 13/16" and the length is 3 3/8". Wrap the card stock around your form and glue with Elmer's white glue. I use Elmer's on paper projects, it takes a little longer to dry, but when does it's permanent. Tacky is always flexible and can pull apart. When the seam is dry push the card stock cylinder down and away from the form a bit. Put some Elmer's on the edge and place onto a circle of card stock larger in diameter than your cylinder, let dry. Trim the circle to the edge of the cylinder and now you have a pot with a bottom. When the seams are good and dry sand them a bit to soften the edges. The handles are 1/14" x 3/16" and made from wire. I used 26 gauge paddle wire. I buy it in the floral department, it's wound on a plastic paddle and hanging on a peg hook. 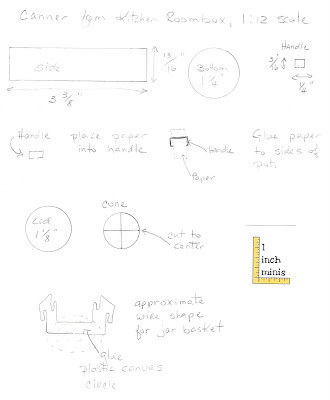 Use paper and Elmer's to glue on the handles on opposite sides of the pot, see diagram. Canners have rolled edges and raised ridges on them. We are going to make these with buttonhole thread. Use Elmer's to glue thread around the top of the pot. Glue another piece of thread about 1/4" down from the top, under the handles, let dry. Lid. Cut a circle of card stock the diameter of your pot. The lids are raised and that's done by making a cone and gluing it to the center of the circle. I used the 7/8" circle, marked the quarters and drew lines to find the center. Cut on one line to the center. Overlap edges about a 1/4" and glue together, let dry. To soften the pointed top, place your finger into the point and press onto a flat surface. I made a lip on the lid so that it doesn't slip off the pot. This is the trickiest part. The lip needs to fit inside the pot. Cut a strip of card stock 3/32" wide, about 3 1/3" long. Place it inside the pot along the top edge to get a length. Pull it just a smidge more and glue the ends together. Center the lip on the lid/circle and glue with Elmer's, let dry. Flip the lid over and glue the cone shape onto the top of the lid in the center. Glue on the handle at the top of the cone just as you did the handles on the sides of the pot. For a rolled edge on the outside edge of the lid glue on buttonhole thread. I used Delta's Permenamel Emperor Blue, (a dark, dark blue) and Permenamel Ultra White. I finished with Permenamel Clear Gloss Glaze. To speckle, I dipped an old toothbrush into the white paint and quickly ran a popcicle stick over the bristles. If you are going to place jars of beans into the canner: cut the plastic canvas circle the diameter of the inside of your pot. Paint the plastic canvas circle silver. Glue 7 jars onto the plastic canvas, use Tacky for this, it sticks better to plastic. Coil a strip of card stock the width you need to keep the jars up and out of the pot. Glue the card stock into the pot, then glue the plastic canvas full of jars onto it. Take wire, painted silver, if needed, and bend it to resemble the handles on the jar basket of a canner. These can be pinched on or you can glue them. **You can make these handles actually hold the plastic canvas if you want and discard the card stock coil. Make the handles from 1 piece of wire, bending over one side of the pot, going down and under the plastic canvas and up and over the other side. I have a diagram drawn. Do this and then paint it all silver and then glue on the jars. At the time of year Wal-Mart should have canners to look at if you are not familiar with what they look like. How to make a miniature toaster, 1:12 scale. This toaster is in my Kitchen Room Box and my First Apartment Room Box. It's modeled after the classic ToastMaster toasters. 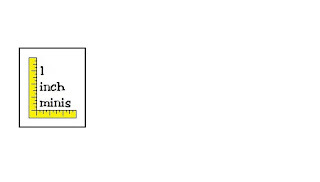 I've given a diagram with measurements. If you would like actual patterns, please e-mail me. The two 3/32" thick pieces from pattern#2 are the toast slots. I use a scroll saw to cut out my wood. To cut the patterns all the same glue the wood together with paper between. Rough cut, about a 2"x 2", something you feel comfortable with under the blade. Now cut paper the same size. For pattern #1 cut one piece of paper. Use glue stick to glue the paper to one of the 1/16"x 2"x 2" pieces of basswood. Now glue stick on the paper and glue the second piece of 1/16"x 2"x 2" basswood on top, making a sandwich. Hold this together for a couple of minutes or use a small clamp to secure. Cut 3 pieces 1/16"x 2"x 2" of basswood and 2 pieces 3/32"x 2"x 2" basswood. Cut 4 pieces of paper. Glue the paper between the basswood as before, clamp. Set C will be the toaster slots. Cut out the slot on the scroll saw. Now separate them. Using wood glue, glue: B to C to B to C to B together, keep all edges even, clamp and let dry. Glue one of A to each side of your toaster assembly matching the bottoms, let dry. Glue the bottom onto the center of the bottom of the toaster. To have a smooth look to the toaster, paint the end grain of the center section with gesso, let dry, sand and repeat. 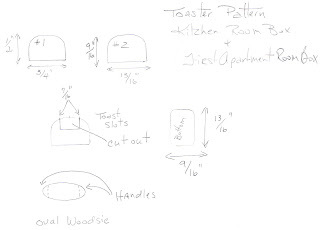 Use a oval "Woodsie" for the handles. I sand thin on each end before I cut off the tips for the handles. Glue onto toaster into the seam where the bottom and toaster meet. Sand the end of another "Woodsie" for the lever. I used a rounded end of a toothpick for the "lightness/darkness" knob. Scrape a slot in one end of the toaster, in the center of 1/16" piece of basswood. Glue the lever at the top of this slot and the knob at the bottom. Drill a hole into the other side of the toaster, in the seam where the bottom is glued onto the toaster. This will be for the electrical cord, made from painted wire or string. I made the plug from polymer clay, but you could carve it from wood and glue onto the cord. I used Delta's Permenamel black and silver, and Permenamel Clear Gloss Glaze. Paint the inside of the toaster black along with the bottom, lever, knob, cord and plug. Paint the toaster silver. Finish with the clear gloss glaze. I hope you like your new toaster, this fits in the late 1930's up to now, I've seen these in the stores. I thought I would start with this lamp, it's one of the first things I made and also wrote instructions for. 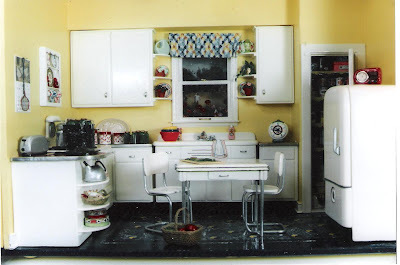 Also, the kitchen is 1940's and I love the era, but I mostly do contemporary rooms now. No worrying about what does not belong in the scene because "They didn't make those in 19......". 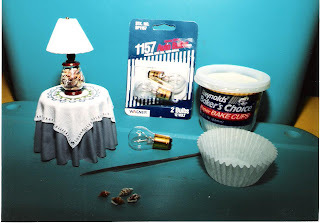 The things needed are: an auto light bulb, this one is a signal bulb, polymer clay, a toothpick, cupcake liners, a small gold bead to act at the finial on the top of the lamp and some card stock for the shade, and a flat gold bead that looks like a washer. 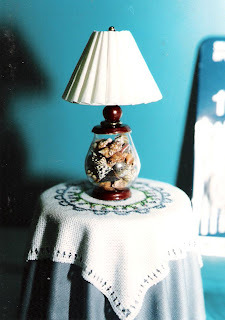 And whatever you want to put inside the lamp, I used tiny shells. Please read through the instructions, I usually leave something out in the items needed because I'm usually making things from what I have on hand. Carefully cut the metal end off the bulb. I used a small triangular file for this. Please wear safety glasses for this. Sand the cut edge of the bulb after the metal part is off. Use polymer clay for the top and bottom. I used brown to simulate wood, but you could use any color to coordinate with your room. Shape the clay to fit your bulb. I pushed the bottom of the bulb into clay so the bulb would sit right. I also made a small round bead to go the the top of the top. Make a hole through the bead to accommodate a toothpick. Bake your three clay pieces according to package directions. While the clay is baking make the shade. Using the pattern, cut the shade shape from card stock. Glue together, for this I used Elmers, it's paper to paper and you can't beat Elmer's for this. Cut from card stock the round center for the shade. Make a hole in the center of this circle to fit the toothpick. Glue this circle inside of the shade. Let dry. After the clay pieces are done baking and cooled you can begin to assemble the base. Glue the glass bulb to the base, making sure the bulb is straight all around. Ahhh, glue. What can I say, we all have our favorites. For this I would use something that is not flexable when dry, such as a tacky glue. For this I used Beacon's 527 glue, I bought mine from Wal-Mart. Fill the bulb with tiny shells. Glue on the top, Beacon's 527. Glue the flat gold bead, (you can make this from polymer clay and paint it gold) and then the round polymer bead you made onto the top. Let dry. Paint the toothpick a gold/brass color. To finish the shade I used a cupcake liner because it looks like the pleated shades we have now. If you have a mini-pleater you could use it with the fabric of your choice. Make a cut between a pleat and cut out the bottom of the cupcake liner. Carefully fold along the pleats to compress them. I usually don't have to cut any excess liner off. All the liner is used to go around the cardstock shape you glued together earlier. Once you have compressed the cupcake liner, glue it to the cardstock shape, Elmer's. Over lap a couple of pleats. Slide the finished shade onto the toothpick. Glue this assembly into the polymer clay bead on the top of your lamp. Let dry. Move the shade so that the bottom of the shade is above the top of the polymer bead. Glue the shade to the toothpick and let dry. Carefully nip off the toothpick just below the top of the shade. Glue a gold bead, round or oval, to the top of the toothpick. 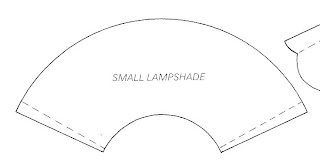 I am knew to this, and the lamp shade pattern may not print out the size you need. From what I understand you can copy it into one of your programs and adjust the size. If anyone can help me with this problem, please feel free to offer suggestions. I am going to be putting patterns on the blog and need to have them the right size for you to use. This is my kitchen room box. Before making this box I did a little research by buying a few old "Better Homes and Gardens" from a flea market, circa 1940. Let's take a tour. I made the box with a false back to allow for a window scene and pantry. The floor is painted to look like linoleum, the cabinet doors and drawers do not work, there's a teapot, round tin, toaster, a canner with jars of beans inside, a percolator, flyswatter, calendar, wall shelf, stove, canister set, sink, cookie jar, lots of stuff in the pantry, refrigerator, radio, table and chairs, cutting board and knife and the basket of tomatoes and beans. I plan to share with you how I made most of the minis in the scene on this blog. If you have any questions about the "how to's" please contact me at my e-mail address. Hi my name is Kris Compas, "1 inch minis". With this blog I would like to share my methods, patterns and ideas with you. I make room boxes and I make nearly everything in them. 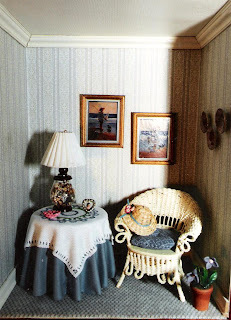 I have recently been published in "Miniature Collector" magazine, (April, 2009), Wow! That was a thrill. My article was "Miniatures on a Budget". These are the rooms I will be demonstrating how to make along with the other things I dream up and figure out.